Should all sites include this? The WAI website is designed to let you change the text size, text and background colors, and other display settings through standard browser settings. 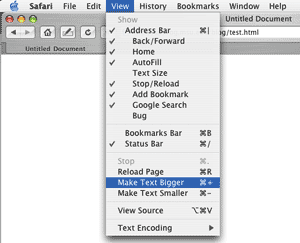 This page shows you how to use some of these browser display settings. "Why doesn't this work with some other Web sites?" explains that these settings may not work on browsers and Web sites that do not meet accessibility guidelines. "Should all sites include this?" explains that including these instructions is not an accessibility requirement. 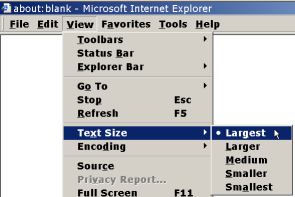 Make Text Bigger Command+ . Why doesn't this work with some other websites? 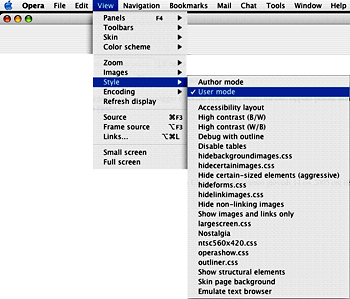 The browser settings on this page should work when browsers and websites meet WAI guidelines and are designed for accessibility, flexibility, and user control. However, some browsers do not provide as much user control, and some websites are designed to defeat browser settings. Text resizing does not work well in browsers and websites that do not meet accessibility guidelines. 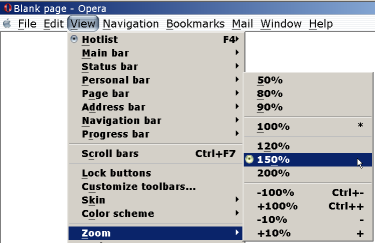 Opera resizes all aspects of a Web site, including font, images, and sections. Resizing should work fairly well in Opera, even if the Web site is not "coded" for flexibility. It is not an accessibility requirement that websites include information on changing text sizes and colors like this page. WAI chose to include this information to help people who want to know how to change their browser settings and may not know how. 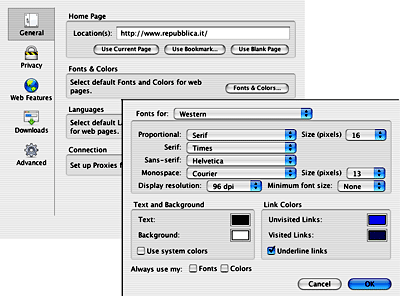 Web browsers and websites should be designed following WAI guidelines so that people can easily change text sizes and colors. W3C WAI does not endorse specific Web browsers and does not recommend one browser over another. While some common browsers are included in this page, mention of a specific browser does not imply endorsement or recommendation. Editor: Shawn Lawton Henry. Developed with input from the Education and Outreach Working Group (EOWG).